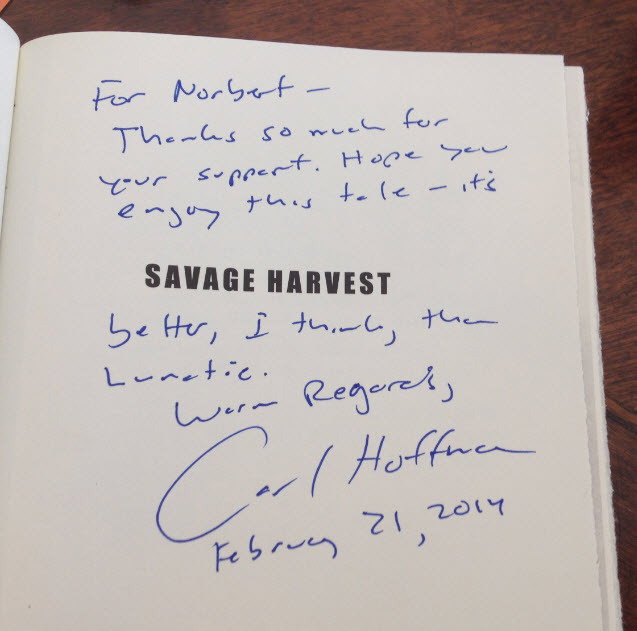 For me, reading Savage Harvest represented a vicarious journey into a world that is hard to believe still exists today in 2014, a journey into the stone age. 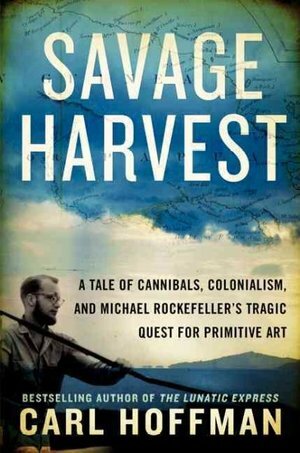 It blew my mind wide open, and now has me pondering primitive art (I am going back to the Metropolitan Museum of Art as soon as I can get back to New York City), cannibalism (and the fact that is most likely still exists in today’s world in remote places), and exotic travel. Carl Hoffman, the author of Lunatic Express, which I reviewed here four years ago, has made several journeys to Papua New Guinea, investigating the disappearance of Michael Rockefeller, who vanished in New Guinea in 1961 at the age of 23. Michael was the son of Nelson Rockefeller, then governor of New York, soon to be Vice President of the United States, and one of the most powerful and definitely richest men in the world. He was interested in primitive art and was on a quest to bring some of it home to New York by immersing himself into the culture in Papua New Guinea with the Asmat people. The photo below shows the young Rockefeller surrounded by Asmat villagers in what appears to be a jubilant dance. On November 20, 1961, he disappeared without a trace. All the power of money and government swarmed down on New Guinea, yet nobody could find a clue. Michael Rockefeller had vanished. Reminiscent of Into the Wild by Jon Krakauer, Carl Hoffman meticulously retraced Rockefeller’s steps in New Guinea, searched records in the Netherlands and many other parts of the world, and unraveled the mystery of the disappearance one tedious step at a time. Since what happens amongst stone-age primitive people cannot be researched by reading archives, Carl immersed himself with the Asmat. Here is a picture of Carl with some of his Asmat friends when he lived with them while researching Savage Harvest. What fascinated me about this book was that there were people in 1961 who were so untouched by the rest of the world, so remote, that most of them had never seen any white people, save a few forlorn missionaries. They were a very violent culture, practiced cannibalism as an accepted ritual as they had done for thousands of years. The Dutch and later Indonesian authorities and the Catholic Church worked on eradicating cannibalism with the Asmat. I can imagine that there are, today in 2014, still isolated tribes in the interior of New Guinea, and possibly other remote places in the world, that have not been touched by any civilization from the outside, save the contrails of modern jet travel, who still practice cannibalism today. I had started Twitter and email exchanges with the author after my review of Lunatic Express in 2010. Then, two years ago, I contributed to the author’s kickstarter project to fund his second trip to New Guinea, and in return I received my own hardcover signed copy. Thanks, Carl, for a great project completed. It lived up to all its promise and more. Yes, I have seen this. I had another post which I kept on file, the rumour about Rockefeller going missing until he was caught on camera a few years later. Thank you for sharing Norbert, the book sounds very fascinating. 🙂 So, is he still alive? No, Hoffman thinks he has evidence that he was murdered and eaten. Ohhh! wow! worth reading then.